Priorities helps you figure out what you're up to, get it all out of your head, and then decide what matters to you and whether the work you're doing reflects that. Get everything you or your team is doing out of your head. Set a general priority for each thing. Record how much attention you're giving each thing. Look for the disconnects between how important you say something is, and how important it is to you in practice. The goal of Priorities is to help people and teams talk about what they're doing, what matters, and whether the two line up. Before you can start using Priorities. You need to create an account. Please fill out the form completely. If you're a manager, name a list for your team and use it to capture everything your team is working on. If you're an individual, name a list for a given context, such as "Work" or "Home," and use it to capture everything you do in that context. If you're a product owner, name a list for your product, and use it to capture features or areas of product development you want to prioritize. 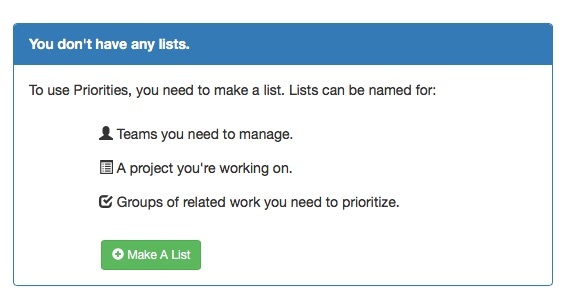 Once you've made your list, start populating it. I'd recommend just entering goals at this point. Don't prioritize them or otherwise think about them. Just get them all into the list. If you're a manager, do this exercise with your team: You might find they're working on things you didn't know about. Work your team does to support another team on a regular basis. A feature for a product. A developmental area, personal or professional. A new practice the team wants to adopt, such as a group of writers deciding they need to copyedit each others' work more regularly. How Do I Set Priorities? No Priority You know it's a thing but you don't have any plans to do anything about it any time soon. Low Priority This is something that would be nice to have some day, and that isn't at all necessary now. Medium Priority This is something that requires at least some maintenance on your part as a secondary duty for someone, even if it doesn't warrant your full attention. If it slips for a little while, it won't cause too much pain, if any. High Priority You have to actively work on this, either to build it or to maintain it to a high standard. Once you've got everything into a list and set priorities, you should review the level to which you're supporting each of your goals. Enter an honest assessment of whether or not you're doing (or able to do) everything that goal requires to be completed to a high standard. 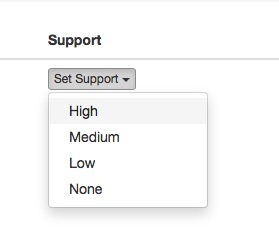 How Should I Think About Support? No Support The item in question is getting no support at all. Nobody’s paying attention to it or you're never doing it. Low Support The item is getting very little support. Someone — maybe not the same person every time — checks in on it now and then, there’s a long backlog of issues with it that are addressed irregularly. Quality may be relatively low. Full Support The item is getting full support. The person or people working on it prioritize it above other things, and it’s being completed to a high degree of quality. 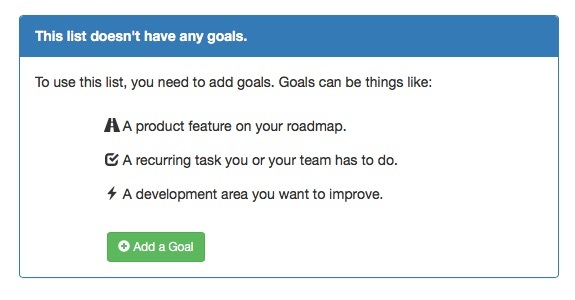 As you enter the support you're giving each goal, you'll notice that the icon in the "Health" column on the left side of your list of goals is updating to reflect the alignment of your priorities and work. Indicates that you're supporting the item at about the same level as which you've prioritized it. Indicates that you're supporting the item to a slightly lower standard than you've prioritized it. Indicates that the level of support you're giving something doesn't match your stated priorities at all. Once you've entered all your goals and the levels at which you're supporting them, the list acts as a reviewing tool. Each column can be sorted by clicking on its heading, which provides you a way to see your goals ranked by health, name, priority, and support. These goals are in poor health because the amount of support or attention you're giving them is badly out of alignment with how important you reported that they are to you. That may mean you need to give them more attention, or it may mean that you need to set a more reasonable priority for them. These goals are in moderate health because they get a little less support than you'd like to. When you review them, ask what value they represent to you and double-check your prioritization. Is the effort required to get them up to full health worth the payoff? If not, are they as important as you thought they were? It's always good to review these goals and make sure that you're not putting more into them than you need when you have other goals that could use more attention. After you've completed your first exercise with Priorities, remember to keep it up to date: Check in every week or so to remind yourself of your priorities, and review in more depth regularly -- once a month or once a quarter.